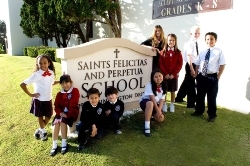 Saints Felicitas and Perpetua School (SSFP) has served children in K – 8 grade in San Marino and the greater Pasadena / San Gabriel Valley since 1950. In 2013 we began accepting 4 year old children into our Transitional Kindergarten, a two year program preparing students for first grade. Our mission is to foster the holistic development of each child through a religious-based academic curriculum which instills a love of learning, the value of service, and respect for all people. Students who attend SSFP are presented with a rigorous curriculum, which includes English, math, science, and social studies and are supported with resources given by the homeroom teachers or the math and reading specialists. Students also have weekly classes in music, physical education, and technology. Extra-curricular activities help to round out the experience of our students. In addition to after school sports (flag football, volleyball, basketball, track), our students can participate in Student Council, Academic Decathlon, Speech and Debate, Theatre and Choir. Each year, we have two school wide concerts, a poetry café, a festival of the arts, and a science fair. SSFP has an active parent base that is very supportive of both the students and the teachers. The school prides itself on its sense of community, which is fostered through open communication between teachers, parents, and the administration. We are an inclusive environment consisting of students from diverse cultures and socioeconomic backgrounds and welcome interested families to tour our school. Our school is accredited by WCEA and co-accredited by the Western Association of School and Colleges (WASC). This means that our school successfully meets recognized criteria for a quality school program.